Strategies to enhance engagement and comprehension of assigned texts. Build anticipation with Meet-the-Author movies. Bridge understanding with vocabulary lists. Customize book selection with the Text Complexity Toolkit. Hook readers and foreshadow content with book trailers. Access content with audio excerpts. Promote critical reading with book guides and lesson plans. Model summarization strategies with reader's theater scripts. Hear authors reflect on their writing process. Springboard student lead discussions with book guides and lesson plans. Use book trailers as models for demonstrating comprehension. Extend writing with reader's theater scripts. 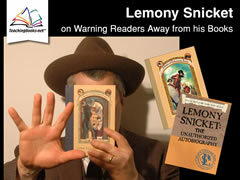 Introduce a lesson with Lemony Snicket's Meet-the-Author Movie to build interest and create a purpose for reading. Create a jigsaw activity using Kate DiCamillo's interviews to compare and contrast voice and content. Use the book trailer from All the Bright Places to model student versions that demonstrate characterization.